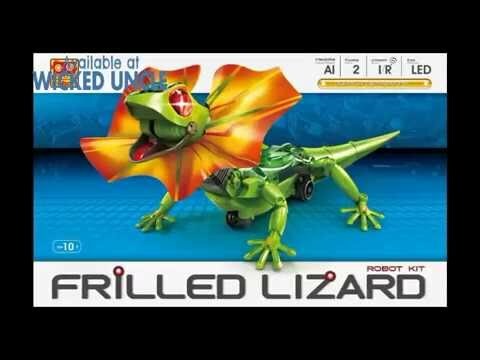 Build your own robotic super-smart lizard with artificial intelligence and an infrared sensor. Follow the detailed manual to construct your own 37cm long robot lizard, programming the infrared sensor to make him follow you like a pet or 'escape' using the 2 way function switch. In his brilliant escape mode, he will automatically unfurl & shake his frill, drop his jaw and angrily illuminate his bicolor LED eyes as he scurries away with fast running legs and wagging tail. Taking about two hours to build, a superb kit to learn about the basic concepts of robotics - brilliant fun and highly recommended. Build four different solar powered robots with moving parts.